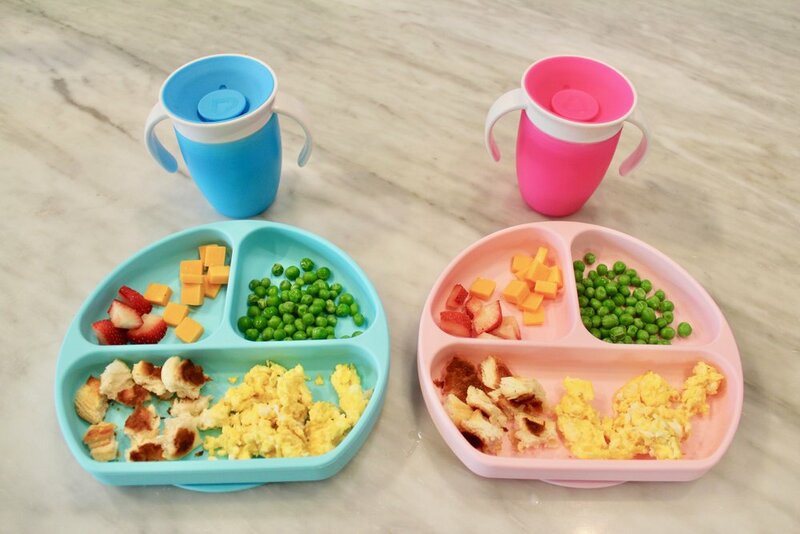 One of the BEST transitions we’ve made so far with our twins was moving from bottles to a full blown self-feeding toddler diet—shifting the responsibility at meal times back to the kids! :) When I was a young girl, I was very picky with my food. And to be honest, as a grown woman and mother of two, I’m still picky! This is something I’ve hoped to avoid in my own children. Offering a wide variety of healthy foods has become one of my priorities in raising Joules and Ames. Now, at 15-months old, it’s not always perfect during our mealtimes—Joules and Ames are just like any other toddler. One day they might like something and then the next day they don’t. Despite this, I still offer new and easy solutions to each food group. Since I’m often asked what our toddlers’ diets are like, I’m here to share some recent examples of our toddler meals! 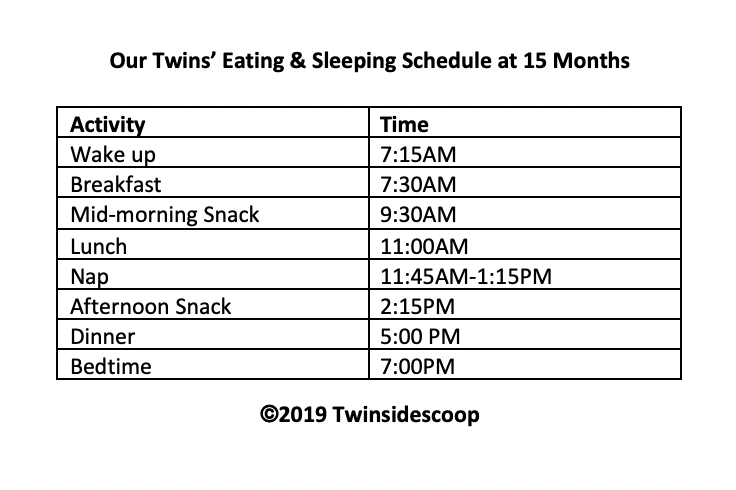 First, to give you more context, here is a table that shows you what our eating and sleeping schedule currently looks like at 15 months old. We are down to 1 nap, 3 meals, and 2 snacks. Meals and snacks are usually only offered in high chairs, unless we are on the go and running errands. A very typical breakfast on our toddler menu includes cheerios, blueberries, and bananas cut up into bite sizes and put into a bowl. They also drink ~8 oz oz whole milk with breakfast. We don’t stray too much from this kind of breakfast right now because the kids have loved eating this combination—and it’s healthy! We usually get a little more creative with lunch and dinners. For each lunch and dinner, I try to offer a meat/protein, vegetable, fruit, grain, and dairy. They also drink ~ 6-8 oz of whole milk with lunch and dinner. Even though we use plates with dividers, I sometimes mix foods together in the same compartment to spice things up. I grew up using plates with dividers that never mixed foods and now I don’t like my foods to touch! Haha. Their protein is usually bite-size chicken tenders, rotisserie chicken, steak, deli meat, or eggs. The vegetables we offer are usually peas, corn, or carrots (their favorite is peas!). Their fruit options are usually oranges, strawberries, bananas, or blueberries. Each meal they are typically offered either cheddar or mozzarella cheese bites, too. Here you can scroll through some examples of recent lunches and dinners I’ve offered our kids. Again, these are just examples and don’t express the entirety of variety that we offer. These are just from the past week! Scrambled eggs, biscuits torn into bite sizes, peas, cheddar cheese cubes, and a strawberry. Peanut butter sandwiches in bite sizes, vegetable sticks, corn, orange slices, and raisins. Rotisserie chicken, biscuits, peas, corn, cheddar cheese cubes, and strawberries. Thick-cut deli turkey, peas, cheddar cheese cubes, and apples. Morning and afternoon snacks lately have consisted of combinations such as 1 Plum Organics snack bar per twin + a handful of Goldfish. Or, we might offer orange slices + a handful of Gerber Lil’ Crunchies + raisins. Nov 25 Bye-Bye, Bottles. Hello, Whole Milk!